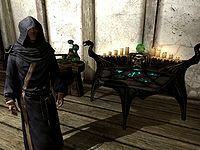 Use the Arcane Enchanter in Dragonsreach, with Farengar Secret-Fire's guidance. On the PC, it is possible to use the console to advance through the quest by entering setstage TutorialEnchanting stage, where stage is the number of the stage you wish to complete. It is not possible to un-complete (i.e. go back) quest stages, but it is possible to clear all stages of the quest using resetquest TutorialEnchanting. This page was last modified on 24 January 2017, at 05:22.